Starbucks is getting fast and fancy with two new store formats. The coffee mega-chain announced today that it would debut two new store formats: one geared toward the coffee snob and one for the commuter on the go. For customers seeking super high-quality coffee, Starbucks is opening its first-ever interactive Reserve Roastery and Tasting Room in Seattle. 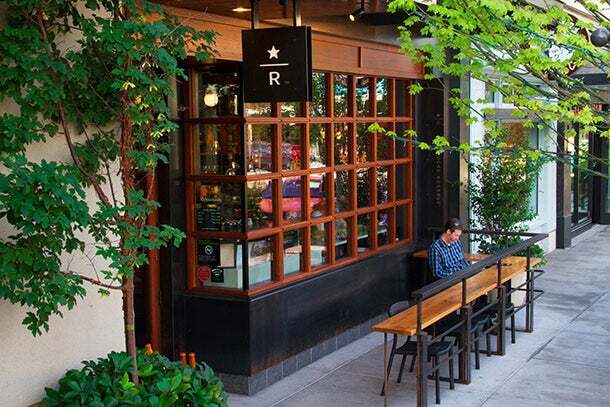 With the Roastery, Starbucks hopes to double its small-batch roasting capacity and grow its Starbucks Reserve coffee presence from 800 to 1,500 store worldwide. Additionally, in the next five years Starbucks is creating at least 100 specialized stores highlighting Starbucks Reserve's limited availability coffees. For Starbucks lovers focused on getting their caffeine fix fast, the Seattle-based company is also testing small-footprint express stores. The express platform will cut down on the number of beverage and food offerings on the menu, as well as implementing digital-payment platforms to increase speed for on-the-go customers. Starbucks is launching the express stores in New York City in early 2015. “The evolution of our store experience is a direct reflection of how our customers are interested in both accessibility to the brand as well as speed and convenience," Starbucks group president Cliff Burrows said in a statement. "Our scale affords us the unique opportunity to bring a flexible portfolio of options rooted in our core commitment to coffee quality." Starbucks is the only coffee chain big enough to simultaneously launch boutique roasteries and express shops. The chain has the money and resources to invest in upscale, home-roasted blends to keep its coffee cred (and prices) high. It also has the vast reach and mainstream demand to make speed a necessity – drive-thru stores account for 40 percent of sales in U.S. company-operated stores. With plans to open approximately 1,550 net new stores this financial year and 1,600 new stores next year, Starbucks' plan to meld quality with speed is only getting bigger.